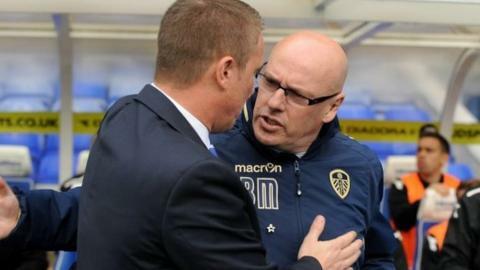 Birmingham City dropped into the Championship relegation zone as three second-half goals ensured Leeds United completed a double over their hosts. Towering striker Matt Smith guided in a neat header to put the Whites ahead. The Yorkshire side, who won 4-0 in the reverse game, doubled their lead within two minutes when Danny Pugh rifled in. Blues defender Paul Caddis scored an own goal, before Federico Macheda's late consolation, as Lee Clark's men slipped to third bottom. Blackpool's 2-0 win at Wigan meant that Birmingham, who have a game in hand over most of their nearest rivals, dropped into the bottom three for the first time since October. Leeds moved up to 15th with their third win in four matches. The Blues had started positively, taking the attack to their visitors in the first half but Tom Adeyemi missed their best chance when he floated his shot over the bar with only the keeper to beat. Despite having most of the play, Birmingham failed to create too many clear-cut chances and were punished after the break when Leeds swept into the lead with two goals in as many minutes through Smith and Pugh. That demoralised the hosts who fell further behind when Caddis put past his own keeper before Macheda reduced the deficit with a powerful left-footed shot. "It is hurting me and my family. It is affecting the enjoyment of living in a fantastic part of the world. It is not great, so I am prepared to do everything to keep us in the league. I know that I can do it. "I believe that I have the backing of the players. A bit of nervous tension has crept in and we need to find a way of eradicating this in the last two games. "Our poor home form is reality. I cannot affect the past but I can the future so why not go out with bang in our last home game against Wigan by winning? "That would set us up for the last match of the season to give us an opportunity to stay in the league. We were energetic and powerful in the first half but to give away goals like we did you get punished." "These sort of things do not frustrate me or unsettle me. The most important thing is Leeds United and what is best for this football club and what is best to take this club forward. That is the only agenda I've got. "The future is looking brighter as we have won three of our last four games. We were top five at one stage but we had a lot of things going on with the ownership, which was really difficult. "These are mitigating circumstances and not excuses. We are now as safe as houses in this league and looking to do well next season." Match ends, Birmingham City 1, Leeds United 3. Second Half ends, Birmingham City 1, Leeds United 3. Foul by Noel Hunt (Leeds United). Scott Allan (Birmingham City) wins a free kick in the defensive half. Corner, Leeds United. Conceded by Paul Caddis. Offside, Birmingham City. Scott Allan tries a through ball, but Federico Macheda is caught offside. Alex Mowatt went off injured after Leeds United had used all subs. Delay in match Alex Mowatt (Leeds United) because of an injury. Attempt missed. Demarai Gray (Birmingham City) left footed shot from the centre of the box misses to the right. Assisted by Tom Adeyemi. Substitution, Birmingham City. Demarai Gray replaces Tom Thorpe because of an injury. Corner, Birmingham City. Conceded by Rodolph Austin. Attempt blocked. Michael Brown (Leeds United) right footed shot from outside the box is blocked. Assisted by Ross McCormack. Substitution, Leeds United. Aidan White replaces Danny Pugh. Attempt missed. Federico Macheda (Birmingham City) header from the centre of the box misses to the left following a corner. Corner, Birmingham City. Conceded by Michael Brown. Attempt missed. Nikola Zigic (Birmingham City) left footed shot from the centre of the box is close, but misses to the left. Assisted by Scott Allan. Goal! Birmingham City 1, Leeds United 3. Federico Macheda (Birmingham City) left footed shot from the left side of the box to the bottom left corner. Assisted by Scott Allan. Attempt missed. Michael Brown (Leeds United) left footed shot from the left side of the box is too high. Substitution, Leeds United. Noel Hunt replaces Matt Smith. Own Goal by Paul Caddis, Birmingham City. Birmingham City 0, Leeds United 3. Mitch Hancox (Birmingham City) wins a free kick in the defensive half. Alex Mowatt (Leeds United) wins a free kick in the defensive half. Substitution, Birmingham City. Scott Allan replaces Lee Novak. Michael Tonge (Leeds United) wins a free kick in the defensive half. Michael Tonge (Leeds United) wins a free kick in the attacking half. Substitution, Birmingham City. Federico Macheda replaces Callum Reilly. Goal! Birmingham City 0, Leeds United 2. Danny Pugh (Leeds United) left footed shot from the left side of the box to the bottom right corner. Assisted by Matt Smith with a headed pass following a set piece situation. Goal! Birmingham City 0, Leeds United 1. Matt Smith (Leeds United) header from the centre of the box to the bottom right corner. Assisted by Michael Tonge with a cross. Matt Smith (Leeds United) wins a free kick on the left wing. Substitution, Leeds United. Alex Mowatt replaces Luke Murphy.